Your relationships might suffer, and more. Running a marathon is more popular than ever. Entry into the big ones--Boston, New York City and Chicago--is a tough ticket to come by. Finish line celebrations may be enticing but does that mean running a marathon’s for you? If you’re training for a marathon based on any of these five reasons, you might want to rethink your strategy. Choosing not to run could be your winning decision. 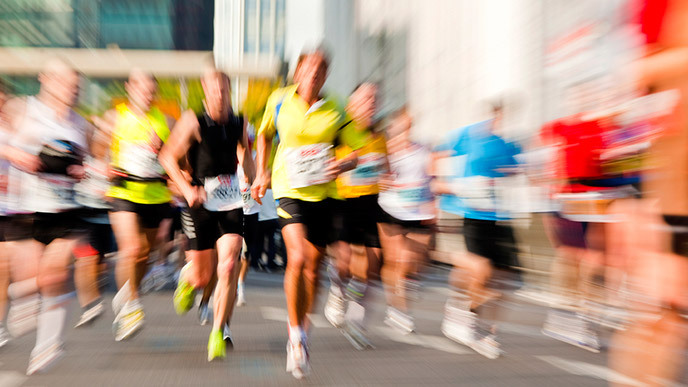 Fantasizing about becoming fit and trim by signing up for a marathon is common. Then reality sets in. The first six weeks, even though mileage is relatively low, many people think they are training hard and they overeat. “You can’t eat like you are running a marathon every day” says Heidi Skolnik, M.S., a sports nutritionist at the Women’s Sports Medicine Center at the Hospital For Special Surgery in New York City. Once the more intensive training weeks do kick in, cutting back on fuel to lose weight can lead to unhealthy habits. “Appetite may increase and as the individual tries to diet, they may end up binging more,” says Skolnik. Weight loss may be a byproduct of a marathon finish, but do yourself a favor and opt out if that’s your reason for running. Marathons are gaining in popularity. As an example, the number of Rock-n-Roll races--complete with 26.2 miles of bands and cheer squads--has risen from 3 in 2010 to over 30 in the last year. While joining the crowd may be inviting, distance running is not for everyone. By some estimates up to 40 percent of runners are sidelined by an injury each year. If you’ve been running regularly, a gradual 16-week training plan may make sense. If not, try on a cool pair of running shoes and gear up for a shorter race. Non-traditional ones, like the wildly popular 5k Color Run, are popping up all over the country. Running a marathon to please others is an uphill battle. If you’re heart is not in it, you’re better off saying no, even if the pressure is coming from your boss or a partner. Training for an endurance race requires a continuous supply of energy, resilience and commitment. If your motives are caught up in looking good, every rainy day, sore muscle or set back will deplete willpower and add to your reasons to quit. Not surprisingly, a study of 106 first-time marathoners conducted by Jacob Havenar, PhD of the University of San Francisco, found “gaining recognition” (along with ”losing weight”) were the two flawed reasons 75 of the participants dropped training all together. If what you value about running is an escape from pricey workouts, structure and intense commitment (both physical and mental), marathon training may be a frustrating experience. Entry fees typically run from $100 to $255 per race, and often include travel, hotel, food and gear. (On average, estimated expenses were $1,800 for out of town runners the weekend of 2014 TCS NYC marathon). Joining a team to run for charity as Terri Hatcher (J/P Haitian Relief Organization) Tiki Barber (PitCCH In Foundation) and Katrina Bowden (Leukemia and Lymphoma Society) did last year may guarantee entry but fundraising pledges are in the thousands. If you don’t make a living on TV, you’re in for a major fundraising effort or a large out of pocket contribution. Strategically, marathon training requires a pre-determined schedule and increasingly challenging blocks of time. For those who cherish the quick exercise and mind-clearing benefits of a spontaneous jog, a rigid training schedule may be far from liberating. If you do your best thinking on a mindless run you may be on to something. New research from the University of Pennsylvania’s Imagination Institute, points to the important benefits of mind wandering, including personal problem solving and creative insight. If driving yourself to stick with a rigorous training schedule (which is what a marathon requires) feels like a brain drain, trust your instincts. Timing is everything. If staying connected to non-running friends is an important priority for the next four to six months, saying no to running the next marathon is an affirming choice. Hard-core marathon training can take a toll on relationships. It’s easy for those closest to us to feel slighted when early nights, mornings and most weekends are devoted to training, rest and recovery. “The second that you 100 percent commit to crossing the finish line, you can kiss your social life goodbye,” says recently married, first-time marathon runner, Mike Diaz, a Tier III trainer at Equinox Fitness Clubs and former professional baseball player. Looking for more balance in your life? Heading to brunch or making pancakes with the family may be just as gratifying in the long run.